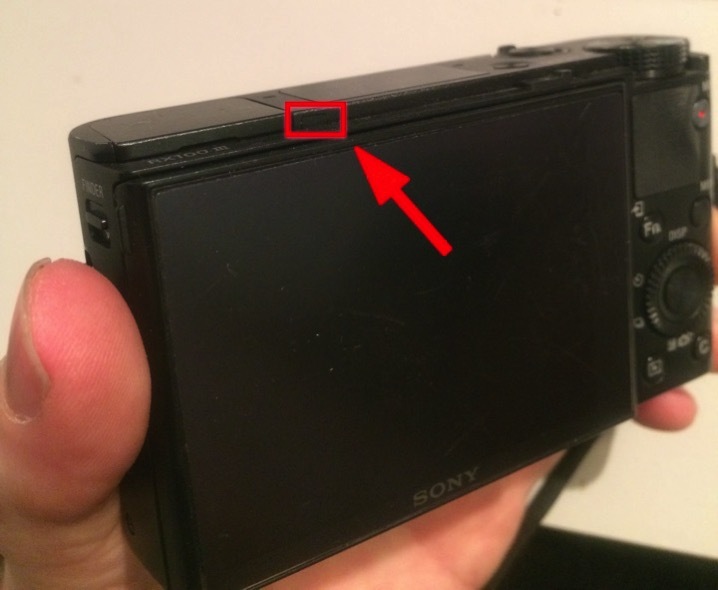 Automatic switching between viewfinder/LCD screen on Sony RX100m3 not working? Try this. I recently had a problem with my Sony RX100 mk3: it wouldn’t automatically swap between displaying in the viewfinder and on the LCD. If turned on with the viewfinder extended, the viewfinder alone would work; if turned on with the viewfinder shut, the LCD would work. But if the viewfinder was on, raising and lowering it to my eye wouldn’t swap between the two. I spent a while faffing with this, convinced it was broken, and failing to find anything on the internet to discuss this. Anyhow, then I found this video which explains the problem, and takes a full two minutes to get to the point. So I’m re-iterating that point, in writing, for everybody using a search engine! Long story short: if you’d guessed that the sensor that detects when it to your eye is playing up, possibly, because of dirt, you’re entirely right. What you might not have worked out is where that sensor is. It’s not in the viewfinder; it’s to the right of it, on the lip above the LCD. Mine didn’t look dirty, but I wiped it down a few times and sure enough, everything worked fine again. Problem solved, and one of the most useful features of this little camera worked properly again. Love watching people fix stuff. "These are clearly black market frankenproducts – made from a combination of surplus mobile phone components and car alarm key rings. I wonder how much they actually cost to manufacture. I wonder if the bits are stolen." Ben Bashford on the magic of Shanzai. And, of course, when a video camera is eight pounds, it's no longer precious, and you start doing weird things with it: Youtube is full of examples. "Curveship is an interactive fiction system that provides a world model (of characters, objects, locations, and things that happen) while also modeling the narrative discourse, so that the narration and description of the simulated world can change. Curveship can tell events out of order, using flashback and other techniques, and can tell the story from the standpoint of particular characters and their perceptions and understandings." This looks both bonkers and brilliant. "Data combined with narrative creates personality. It can be used to construct a larger and richer history around a subject. The world is already divided in to two camps: People who are going to watch the Super Ball and those who aren't. This is an opportunity to delight the former and reach the latter, by providing a larger and more playful cast of characters to describe the events during the game." Nice! "I thought this was a fascinating take on the need within companies for stories… Companies spend a lot of money looking for these stories. Traditional product companies had to ask people and users to tell their stories, normally through market research. Web companies are at a huge advantage: they have rivers of usage data flowing through their servers, and the problem inverses – how to make sense and tease out meaning and interest from such a torrent." This is very good; I'm looking forward to future installments. "If Ferelden has room for priests, elves, mages and golems then why doesn’t it have room for sceptics and scientists too?" Lovely notion – roleplaying an aetheist in Dragon Age (as best possible within the game). In this case, the player character believes in magic, but not in the montheist religion that much of the world ascribes to; miracles are really just magic at work. Subsitute "magic" for "science" and you begin to see his point. It's a nicely thought-through piece. "The closer has confounded hitters with mostly one pitch: his signature cutter." Lovely motion infographics – informative, and powerfully confirming the narration. "The move during the past 10 years or so has been from cameras being precision mechanical devices to molded polycarbonate containers for electronic components. This has meant a lowering of overall physical quality. What one gets in terms of features, functions and image quality is higher than ever before, but the satisfaction of owning and using a high quality mechanical and optical device has for the most part evaporated. Only the top models within any brand produce a tactile satisfaction and please one's esthetic sense." The quotation is from Michael Reichmann; the discussion that follows is as thoughtful as usual from TOP's readers.